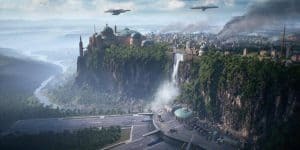 Star Wars Battlefront II Pre-Order Bonuses Announced | Nerd Much? It seems we’re going to be seeing a lot of Star Wars Battlefront II tomorrow, as EA fires up the hype train by announcing the pre-order bonuses ahead of tomorrow’s conference. the Star Wars: The Last Jedi Millennium Falcon with updated sounds and appearance. All of these will be available regardless of the version you purchase, and you’ll have instant access on the three-day early access date. If you don’t catch the pre-order, you can also catch a lot of these features on the Deluxe Edition, including upgraded versions of the four trooper classes. EA has also revealed that we’ll be seeing some gameplay for Battlefront II tomorrow during EA Play. Demos of the game will also be available on EA’s showroom floor, to press and public alike. The company promises that they will not disappoint, but that remains to be seen. Star Wars Battlefront II will be released on November 17, 2017 for PS4, Xbox One, and PC, and it’s one of our most anticipated games of the year.